Narayana Hrudayalaya in talks with Panacea Biotech to buy its Gurgaon Hospital?? Bengaluru: With the news floating around that Narayana Hrudayalaya is in advanced talks with Delhi based drugmaker Panacea Biotec, to takeover its Gurgaon Hospital, all heads have been rolling. 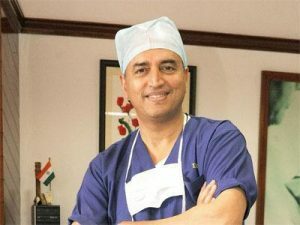 On 1st March,2 016, ET now reported that the Renowned cardiologist Dr Devi Shetty founded multi-speciality hospital chain Narayana Hrudayalaya is in advanced talks to buy out Delhi based drugmaker Panacea Biotec’s multi super-speciality hospital located in Gurgaon, Harayana. “The Gurgaon hospital has been on the block for a while now and Panacea Biotec is looking to reduce its debt via this potential transaction. The deal is likely to be struck for around Rs 180-Rs 190 crores and an official announcement is expected in March, 2017 ,” a source familiar with the ongoing discussions had informed ET, which it reported. Immediately after the report, the market went into frenzy with the shares of Panacea going up as high as 15% in response to the news. The response of the stock market was indeed so vehement that BSE itself wrote to both the parties in an attempt to confirm the validity of the news. BSE had sought clarification via email regarding clarification and confirmation after the channel reported that negotiations were taking place between Narayana Hyrudalaya and Panacea Biotec. Healthcare services provider Narayana Hrudayalaya Limited while affirming that they are in talks with the pharma company, clarified that it has not taken any decision on buying Panacea Biotec’s Gurgaon Hospital. “We would like to clarify that at this stage, we have not taken a decision regarding this opportunity (buying of Panacea Biotec’s Gurgaon Hospital) and not entered into any binding definitive agreement,” Narayana Hrudayalaya Compliance Officer Puja Aggarwal said in a BSE filing here. Narayana Hrudalaya confirmed that the company has been in discussions with panacea Biotec for Gurgaon Hospital since October 2015. Giving the chronological order of the events, the company said in December 2016, it had signed a non-binding MoU with the counter party and in March this year, due diligence is under progress. The BSE also asked whether the company is aware of any information that has not been announced to the stock exchange which could explain the aforesaid movement in trading. Founded in 2000 by the renowned cardiac surgeon Devi Prasad Shetty, Narayana Hrudayalaya currently has a network of 23 hospitals and seven heart centres across India with over 5,300 operational beds. The 224 bed Gurgaon Hospital has been set up through Panacea Biotec’s subsidiary New Rise Healthcare Private Limited in which the company holds 87.4% stake. The company in its reply to the BSE, confirmed what NH had earlier confirmed stating that the hospital could not be completed and commercialized due to non availability of capital investment and the company is currently in talks for partial/complete sale of its stake in the said subsidiary . 5 comment(s) on Narayana Hrudayalaya in talks with Panacea Biotech to buy its Gurgaon Hospital?? This surgeon is hungry for praise and wants to be in lime light for one or the other cause. He is like AmitabBachan for Shouchalia . Wants Praise for himself . Yes u r right . He always appears in ot dress just to fool . Even he fooled then govt of India and became m c I governo. He spends rs 10 and takes 1000 rs publicity . To appear in ot dress is unethical and it is only to fool the public . Can you please name the Gurgaon based hospital being reported here?